Advance VIP, General Admission, and Student tickets at Boo Boo Records in SLO and all VALLITIX outlets. Order online at www.vallitix.com or charge by phone at 888-825-5484. Blankets and low-backed beach chairs (2' or less) only (very limited space 1st come-served). No high back chairs. Children under 10 admitted free when accompanied by paid adult (one child per one paid adult). Rain or Shine. No umbrellas. No pets. Beer & wine available for over 21 with ID. Please no outside food or beverages. Food and beverage for purchase inside venue. Ins and outs ok. Subject to Search. A portion of the proceeds benefit the future Summer Jazz Workshop and SLO Jazz Festival, a 501(c)3, and all the community charities it serves. MAIN ENTRANCE: is by San Luis Obispo Museum of Art on Broad Street. 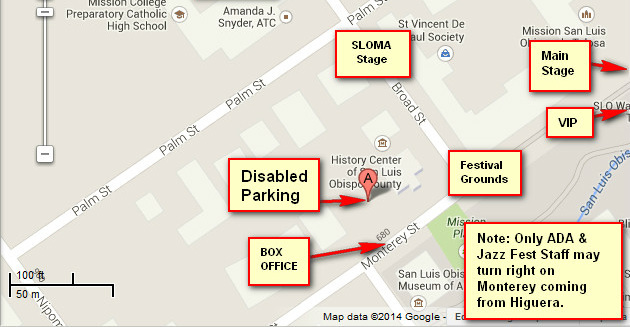 The BOX OFFICE is located at 680 Monterey, just inside Festival Grounds. Only ADA and Festival STAFF may make a right turn from South Broad into the lot at 680 Monterey the entire day of Jazz Festival.